SOA, or Service Oriented Architecture assumes that there are interoperable services used to build the target service. This approach does not tie any service involved into interaction to any specific OS or technology, as long as the protocols used (say, HTTP) are fully supported. It means the SOA-type service consists of unrelated interoperated services, that can be distributed over Net and work completely independently of one another. An example: service posting sites updates to microblogs and other stratusphere services. Such a service would take data from sources (sites) and post it to other services, completely unrelated. To interact, the services use a number of protocols, such as SOAP, WSDL and similar, based on REST, RPC, DCOM, CORBA or plain HTTP. That makes the service independent of a certain technology and/or product underlying any given service. In general, it does not matter what type of Web server software, OS etc. is used to run a service as long as it complies with the protocol used to communicate with it. The main problem of debugging and solving efficiency issues in such cases is the lack of access to the related logs: generally, it’s not possible to access internal data of a given service involved. IPHost Network Monitor provides means to make SOA-type services development and usage easier, since monitoring is required at every stage of SOA-type service lifespan. SOA monitoring relies upon analyzing the relation between requests sent to services and response received. Thus, advanced monitors like Web Transaction Monitor and techniques involving usage of Monitoring Agents can be successfully employed to create monitors detecting any bottleneck, poor connectivity and other conditions preventing the service from operating normally. To prevent sudden service slowdown or complete disruption, a number of alert types can be used: email, SMS, IM messages. Since most of them can be automatically processed, this gives an additional flexibility, allowing to perform emergency actions. For example, if a service used become hardly accessible or shuts down, it is possible to switch to alternate (backup) service until the primary one gets up again. Apart from supervising the external services, all the internal ones can also be monitored efficiently to detect any non-standard situations or signs of such situations about to happen. Monitoring CPU load, resources availability and so on can help to detect the bottlenecks and/or other weak chains in overall system. Let us describe the mentioned monitor types in typical situations common for SOA-type services. Web Transaction Monitor simulates real user’s actions by sending data to Web servers (filling forms), analyzing the data received and proceeding to new URLs if necessary. In the case of SOA, this kind of monitor can be used to control availability and general health of a service involved (say, data posting service, email service, backup service and so on). A specific alert can be created to notify human and/or automated operators that the service is not available, thus allowing to seamlessly switch to alternate service without interrupting the overall process. 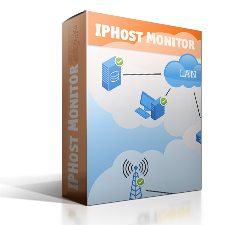 IPHost Monitor Agent can be used to watch the services that can’t be analyzed directly, due to security and other restrictions. It is a special IPHost Network Monitor installation gathering data and sending it to the main installation – either on its accord, in active mode, or waiting for request to send data back. 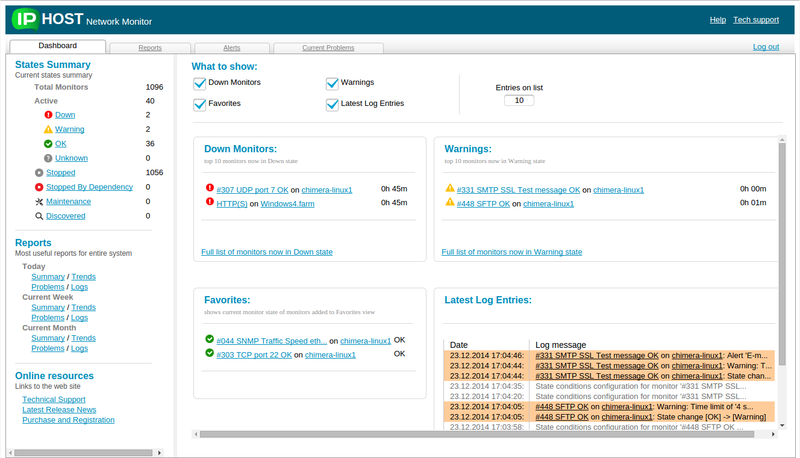 It allows to perform monitoring without compromising intranet security. WMI monitors, specific for Windows-powered systems, use the WMI protocol to access numerous data type about the system and its components. 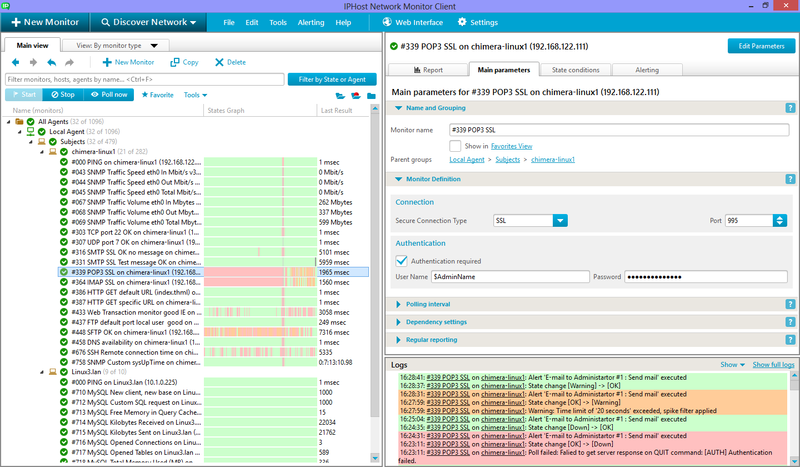 It can track CPU load, available disk space and a number of other parameters. SNMP Traps monitor available for every system supporting SNMP allows to execute immediate alerts if a certain condition occurs. The condition can be tested by any third-party program or script, thus this type of monitor is a universal means of supervising system’s capacity as long as there are suitable means to provide necessary data. Database monitors such as ODBC monitor allow to interact with database servers, check for any condition that can be tested with SQL script and interpret the result – to raise a certain alert, for example. Every parameter that can be measured by means of SQL query can be watched. Not that there can be other types of monitors required in certain cases; the variety of available monitor types makes it possible to monitor virtually any type of service.